Jerry left me in Boulder with a tiny kitchen and dishes for one. 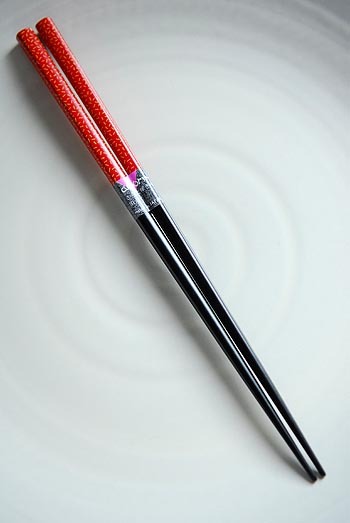 He shopped at a local culinary fun house (which I’ve yet to explore) and found a pretty set of new chopsticks, Japanese style, with bright red tops and little yellow squiggle designs. But only one pair. – This open-minded, educated, forward-thinking community. Its brain jibes with mine. – Trails. Everywhere—for feet and wheels. All I do to find the view below is head half a block downhill, turn left past the nature center, and there it is: covered in myriad paths up and into and around the Flatirons. Heading there right now with my coffee…. – Drivers, who more or less are courteous to the cyclists and pedestrians who—almost—dominate Boulder’s roads. – Fitness. I thought I was in reasonable shape (and I know I am). Yet I sputter in the wake of so many pro and nearly-so runners, bikers, hikers and all-around athletes who scale these mountains with barely a breath. But I’ll get closer—I’m walking or cycling everywhere these days. – The Boulder Farmers’ Market, a beautiful sprawling tapestry of fresh foods and colors, accessible by bike (it’s right on the Boulder Creek Path, another new commuter’s love). – So many restaurants and pubs with live music and general liveliness all around. Welcome back to college! – And last but definitely not least, the Scripps program, one of the greatest contributions imaginable to journalism and the environment today. – My big, open kitchen with room to maneuver and the appropriate dish or utensil for every idea in my cook’s mind. – New Mexico food, wine and beer prices. Period. – The ability to buy all of the above at one store. – Perea Farms, El Mezquite, Valencia Fresh Fruteria, my neighborhood farmers’ market, fresh tortillas made daily, honey and eggs for sale around the corner, the scent of roasting chiles in the air everywhere this time of year. I know the local food scene has a lot to offer Boulder, and I have much to explore. But I do miss the down-to-earth nitty-gritty feel of food plucked straight from the dirt—a benefit of living so close to so many farms. – My garden. Right now, right this very minute, I am missing loads of grapes, peaches, tomatoes, eggplants, chiles, chard, collards and arugula. 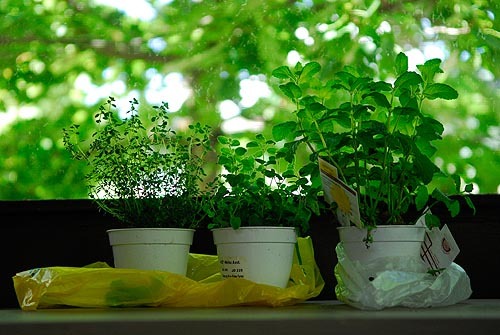 – My herbs. It’s a jungle out there among the dozen basil plants, oregano, onions, chives, parsley, sage, thyme, tarragon, marjoram, rosemary and mint. I’ve bought a few little plants for my Boulder porch (below), but I no longer have the option of chopping down a bundle of onions or a heap of basil and mint for a proper batch of laap. – Dark and quiet. 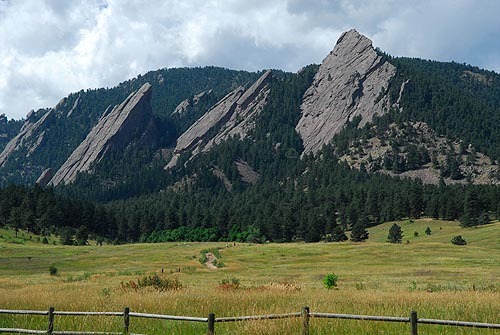 Previous residents have raved about Chautauqua’s peaceful nature. But I’m spoiled, already having the experience of living and staying in some of the world’s most serene locations. I’m liking my cozy cottage quite well, but this park is a tourist destination and a favorite of anyone in hiking boots. I get foot traffic through my little yard all the time. At home in New Mexico, I almost never need to close the drapes. Here, I feel just a bit as though I’m living in a glass house. – Patio dining. Cooler nights spell perfect times for BBQs. Miss that. – My graduate-level environmental studies class watched a video clip of Rachel Carson this week. The last time I’d seen similar footage was in Burma for an Earth Day celebration last year. Here, 20 percent of the class had never heard of Rachel Carson. – Laundry. I’m actually less efficient living alone because I brought few clothes. I’m having to wash smaller loads more often. The machines here are not ENERGY STAR, and I can’t adjust for load size. Plus, I have no laundry line, which means I’m using the dryers. – Garbage. I’m tossing more, more often because Chautauqua does not yet have composting facilities (we’re told they’re coming soon!). At home, we are able to compost or recycle almost all our waste. Some weeks, we have but one little bag in the trash can. Since I’m also tossing food scraps here, I’m having to take out the garbage more frequently because of the smell. – Attitude. Despite the notes above, it’s a given in Boulder—people consider the environment in their daily actions. Bags aren’t immediately given in stores. Shops everywhere sell organic, biodegradable, compostable items. (Just bought a biodegradable plastic file folder.) Living green is the community norm. – Cooking for one. Either I must change my habits, or I’ll have to start giving daily dinner parties. After so many years of cooking for at least myself and a hungry husband, it’s hard now to think and shop in terms of one. I can’t believe how long a single dish lasts—through the next breakfast, lunch, dinner and beyond. Must. Think. Small. Thank you, Erin – and I’ll be sure to monitor my time at The Peppercorn.